Bournemouth's play-off hopes took a hit when their five-game winning run came to an end with a draw at relegation-threatened Yeovil. Kieffer Moore gave the home side a half-time lead with an unstoppable volley from the edge of the box. Ryan Fraser levelled after the break when a Byron Webster clearance cannoned off him and looped into the net. With four games to go, Bournemouth are two points off the play-offs, while Yeovil are five points from safety. Cherries winger Matt Ritchie scored twice inside the opening 20 minutes against Reading on Tuesday, and should have notched another early opener on two minutes but blazed Lewis Grabban's cross over the bar. However, Yeovil nearly snatched the lead when Joe Edwards evaded Ian Harte and pulled the back to James Hayter, but the ex-Bournemouth striker wasted the chance. The visitors did not heed the warning and fell behind when a seemingly routine free-kick into the Cherries box by Jamie McAllister was headed clear but fell to Moore 20 yards out and the youngster rifled an unstoppable volley into the top corner. Bournemouth responded well and ended the first half strongly with the lively Grabban spurning two good chances. The Cherries thought they should have had a penalty just after the break when Webster appeared to handle in the area. Moments later they drew level when the same player attempted to clear from inside his own box but the ball ballooned off Fraser and sailed over Marek Stech and into the net. Yeovil responded well to the setback as Moore dragged a shot narrowly wide and then Manchester United loanee Tom Lawrence weaved his way into the box, but his curling shot crept wide. "We are gutted because of the way they got the equaliser, but I've got to be happy that our lads have got their mojo back. "We played good football and defended well against a team that were looking to win to keep their play-off hopes alive. Their hopes are still alive, but so are ours. "I can at least go home happy that my team looked like a Championship team today." "We lacked our usual zip and sharpness and that's what has held us back. "We had some good play and created a couple of good chances where we should have done better, so we're slightly disappointed. "Our goal was unusual to say the least, the defender tried to clear it and it just hit Ryan Fraser, but sometimes you get rewarded for your hard work." Match ends, Yeovil Town 1, Bournemouth 1. Second Half ends, Yeovil Town 1, Bournemouth 1. Jamie McAllister (Yeovil Town) is shown the yellow card for a bad foul. Shane Duffy (Yeovil Town) wins a free kick in the attacking half. Offside, Yeovil Town. Ruben Palazuelos tries a through ball, but James Hayter is caught offside. Attempt missed. Ruben Palazuelos (Yeovil Town) left footed shot from outside the box misses to the right. Assisted by Joe Ralls following a set piece situation. Tom Lawrence (Yeovil Town) wins a free kick in the attacking half. Corner, Bournemouth. Conceded by Joe Edwards. Attempt blocked. Adam Smith (Bournemouth) right footed shot from the left side of the box is blocked. Assisted by Simon Francis with a cross. Attempt blocked. Kieffer Moore (Yeovil Town) left footed shot from the centre of the box is blocked. Assisted by Tom Lawrence. Byron Webster (Yeovil Town) wins a free kick in the defensive half. Substitution, Bournemouth. Tokelo Rantie replaces Ryan Fraser. Attempt missed. Tom Lawrence (Yeovil Town) right footed shot from the left side of the box is high and wide to the right. Attempt missed. 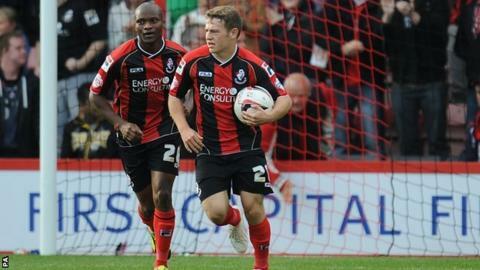 Ryan Fraser (Bournemouth) right footed shot from outside the box is too high. Assisted by Simon Francis with a cross. Attempt saved. James Hayter (Yeovil Town) right footed shot from the centre of the box is saved in the centre of the goal. Assisted by Tom Lawrence. Substitution, Bournemouth. Brett Pitman replaces Lewis Grabban. Attempt missed. Adam Smith (Bournemouth) right footed shot from outside the box is close, but misses to the left. Assisted by Lewis Grabban.